Today I started a basic white batch of sourdough bread. I have been putting in even a nominal amount of cracked wheat because I like the texture and added eye interest. I put only two tablespoons this time because I also wanted to try something a little different. After doing up the Sourdough Kaiser Rolls, I thought maybe I would add a little extra oil and some milk powder to a basic white recipe and see how it changes the crumb texture and the crust. I also want to see if it changes the longevity of the shelf life. Now with my crew I often don’t get long lived bread but when I do, I notice that some of the breads go stale faster. 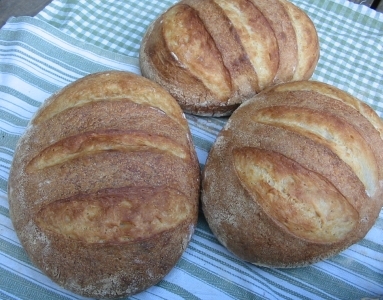 White bread isn’t as bad a culprit as whole wheat bread on this point but white bread that isn’t eaten same or next day, does get stale pretty fast. 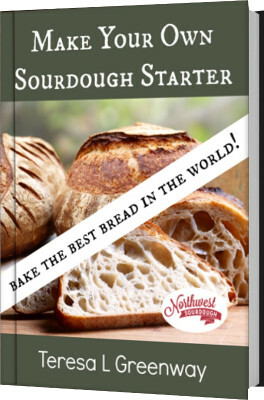 The dough, with no oil or any other additions other than your basic flour, water, salt and starter, need to be eaten same day to be at their best. I know oil, milk, and the addition of egg yolk for the lecithin it contains, can extend the shelf life. 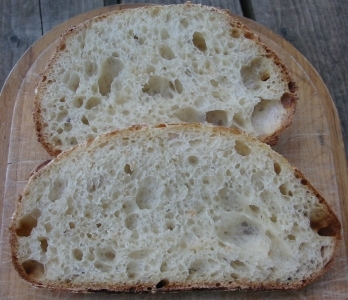 I just thought I would see how much and what changes occur in the crumb/crust. Anyway, I have the boules almost ready to put to sleep, just needing their twist and a basket, and then I will report back tomorrow. As you could well guess, I was pleasantly shocked by the success of the addition of the milk powder and extra oil. This was my regular basic recipe available on the recipe page of my website. The only difference is an addition of 2 Tablespoons of coarse cracked whole wheat meal, 4 Tablespoons of oil instead of two, and 1/3 cup dry milk powder. 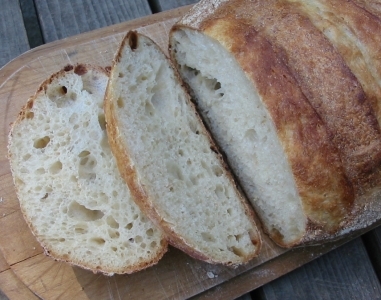 The crumb was soft but still chewy, and the crust was wonderful, it was a crisp crusty texture that shattered when you bit into it and you could taste the caramelization in the crust. The proofing, baking and everything else was the same. Now to see how well the bread lasts. I have to hide a loaf to check this part out! Will get back with the results.